Tyler Herbert and Guy Legarrie left Atikokan for different reasons and at different times. Now they’re coming back for the same thing: to advance their forestry careers at our new Sapawe sawmill, 30 km out of town. Several years ago Atikokan was hard hit by the closing of two forestry operations but the pendulum has swung back and the community welcomes Tyler and Guy, and their families back to Atikokan. Tyler grew up here and began his working career with the M.N.R. before seeking new challenges in the mining industry. The skill and experience that he has acquired in the past few years will prove to be a great asset for his work as our new Maintenance Planner. But it’s not just his children that will enjoy the recreational opportunities in a town known as Canada’s canoeing capital, rumour has it that Tyler intends to give his new co-workers a run for their money in this year’s Bass Tourney. Guy started his forestry career here working for one of the original mills on site for 16 years before leaving in 1997 to take on new challenges with other sawmills in northwestern Ontario. The Sapawe sawmill is scheduled for completion in the spring of 2015 and expects to be operational by the summer. 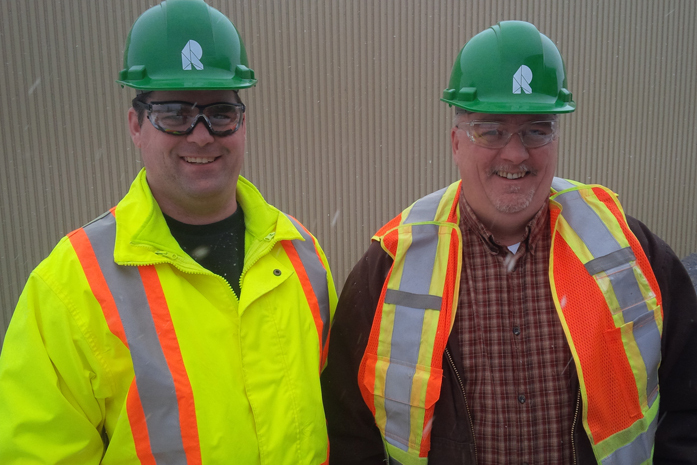 While work continues on site, employees hired for supervisory roles are being trained at our Thunder Bay sawmill to learn to operate these modern systems. By the start of production, the mill will have 90 employees, including 20 tradespeople, 20 supervisory staff and 50 labourers and operators. At Resolute, our team is growing and it’s nice to see Tyler, Guy and others coming back to Atikokan as the $65 million investment in the Sapawe operation creates not only direct employment, but spinoff jobs in harvesting and hauling, as well as other economic activity. Together, we are building a sawmill and a community.